Many of us are familiar with the Amazon webstores. Now just before the Christmas they bring best sides of the globalization to our home sofa´s. Nowadays Amazon is also known as cloud and cloud connected software platform provider (Amazon Web Services, as AWS). One example of these cloud connected software platforms is AWS IoT-service, which enables creation of Internet of Things (IoT). What AWS IoT-service consists of? By simplifying AWS IoT-service is software platform which offers excellent tools for building Internet of Things, at least from software point of view. Physical world actions are converted to digital information by different devices and sensors. AWS IoT software platform helps to transfer this valuable digital information from devices to cloud or vice versa. The communication between devices and the cloud is carried out by using standardized communication methods (MQTT, HTTP REST and WebSocket). 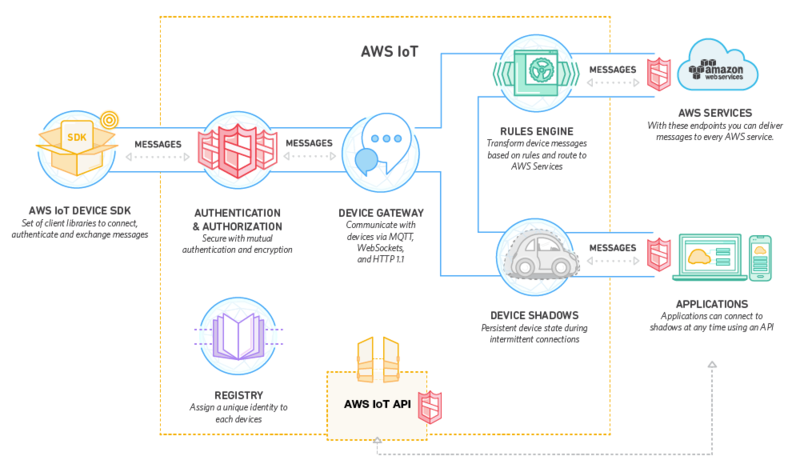 AWS IoT also defines which devices are trusted ones and can communicate with the cloud. On the other hand AWS IoT rule, user recognition and authorization definitions describes which kind of communication is allowed or not and by which users and services. One very interesting capability in AWS IoT-service is the support for sleeping things. Meaning the devices which are on the offline-mode most of their lifetime. This expands AWS IoT-service usage to targets which runs most of the time only with batteries. Continuous data processing is one cornerstone of the future digitalization. In AWS IoT-service data which have reached the cloud is investigated and processed with rules engine. Example, in defined use cases the users are informed or data is modified just before storing to data storage. After AWS IoT-service the data processing can still be continued by using other services, either in real-time or by analyzing the data warehouse information. AWS IoT-service can be extended by using other AWS-services like NoSQL type data storages (Amazon DynamoDB), with large data stream processing solutions (Amazon Kinesis), or with event based architecture solutions (Amazon Lambda), or with object based data storing solutions (Amazon S3), or with messaging solutions (Amazon SNS) or with message queue solutions (Amazon SQS). Remember that there’s no restrictions of using other than Amazon services with AWS IoT-service. Why AWS IoT-service is so interesting? With AWS IoT-service you pay only for transferred data. There is no start-up or license costs. The prizing is quite competitive and there are excellent tools for estimating incoming bills. This kind of prizing model works very well to IoT world, where amount of data sources will expand later on, but especially on the start-up and piloting phase you want to minimize the costs. It uses widely time-honored software components and standardized communication methods in the software platform. AWS IoT-service safety model consists of multiple levels, which can be also sharpened with your own solutions too. It is available for many areas globally. It offers excellent integration and extensibility support. Building blocks are described in the picture below. Cybercom is developing new intelligent service concept named Machinebook. It boosts the co-operation between humans, machines and services. In the Machinebook every device or thing has its own digital instances on the cloud and we call them as Avatars. These Avatars follows the activity of physical side of them in the real world and based on that information they will intellectually decide what to do and then they communicate with humans in the way which is most familiar to us. When Cybercom moved from the drawing boards to action with Machinebook service concept, we bravely used wide range of solutions and services from AWS and one service of them was AWS IoT-service. AWS service library includes great amount of solutions for developing IoT-services. AWS boosted especially the SW development cycles, but also it brings more safety elements to Machinebook architecture. Same time it offers flexibility to cost management. These adds agility and boosts doing new innovative digital services in cost effective way. Developing the Machinebook by using AWS IoT-service offered software elements for collecting the data with safe and controlled way to cloud and for defined humans. AWS IoT-service cloud offered rules engine to check the data and to carry out activities defined in rules files (example store the processed data to data storage and send for defined users).